These and other great tools can help you prepare for and and master your keeper and dynasty fantasy football leagues. 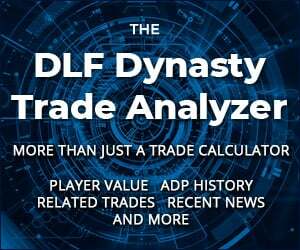 DLF is committed to providing the very best collection of tools and resources in the dynasty industry. Please be sure to check us out with a monthly subscription or annual premium membership. 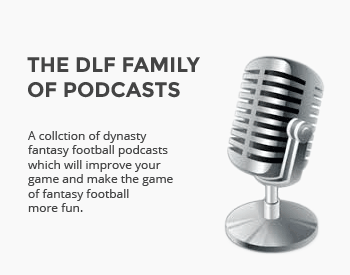 You won’t regret it, Join the DLF Community today! Will Oregon standout Dillon Mitchell be able to make his mark in the NFL? We look at a potential late-round running back sleeper from Nebraska, Devine Ozigbo. Can the JUCO transfer out of Buffalo with a rich bloodline make a name for himself in the NFL? Where should the intriguing running back turned wide receiver prospect be drafted? After disappointing at the Scouting Combine, we re-evaluate Elijah Holyfield's profile. Will Preston Williams excel in the NFL? We examine his profile. We examine Alabama's latest tight end. Will Irv Smith Jr become a top dynasty asset? Dwayne Haskins will likely be a top ten NFL Draft pick. Where should he land in your rookie draft? We examine athletic standout Miles Boykin. Is it worth taking Greg Dortch with a late rookie pick? We take a closer look. Is Noah Fant the top tight end in this year's draft class? We examine his profile. We cover the tough, durable receiver from Nebraska, Stanley Morgan. KeeSean Johnson's profile is a mixed bag. We look at how he will fare at the next level. We look at a runner who appears to check all the boxes, Ryquell Armstead of Temple. Will Andy Isabella overcome his college competition to succeed in the NFL? We examine the wideout. Why should you target Terry McLaurin? We examine the Ohio State wideout. In a deep wide receiver class, where does South Carolina native Deebo Samuel fit? How much upside does Miles Boykin really have? We examine him closer in our Video Profile series. How much of an impact from the big-bodied receiver from Stanford make at the next level? We examine elusive, powerful, former Iowa State running back David Montgomery. He was the third wheel at Ole Miss, but can DaMarkus Lodge make a name for himself at the next level? We break down the former Cyclone who has All-Pro potential. Will Antoine Wesley develop into a reliable fantasy asset? We analyze his college career and look forward. Our Video Profile series continues with a look at Notre Dame running back Dexter Williams. We break down the talents of AJ Brown, whose landing spot could be crucial for his dynasty value. Just how good TJ Hockenson be in dynasty fantasy football? Does he justify the hype? Could Caleb Wilson turn out to be a valuable asset in a strong tight end class? We break him down. He is the top wide receiver for some, but others have their doubts. We break down N'Keal Harry. He wasn't productive, but he has the speed to change a game. We break down Terry McLaurin. Can Greg Dortch provide fantasy value despite his stature? We examine the Wake Forest wideout. Why isn't Will Grier generating a bigger buzz? We break him down in the latest NFL Draft Video Profile. Darrell Henderson is one of the more electrifying running back prospects this year. Does he have the skills to warrant a high draft pick? Does Travis Homer have what it takes to make a dynasty impact? Josh Jacobs is one of the top running backs in this class, but with such little college production, where should you draft him? Will Justice Hill's combine performance push him up draft boards? Will the former Michigan State Spartan carve out a role for himself in the NFL? Can Georgia's electrifying playmaker carve out a role in the NFL? We break Mecole Hardman down. Harmon is an intriguing options in this year's NFL Draft. Where should you draft him? Can Riley Ridley overcome his lack of college production to succeed at the next level? Will Drew Lock end up going early in the 2019 NFL Draft? What does that mean for his dynasty value? What can we expect at the NFL level from the Scouting Combine standout? Our 2019 NFL Draft Prospect series continues with a player who underwhelmed at the Scouting Combine. What can Ohio State's electrifying playmaker achieve at the next level? We consider Kentucky running back Benny Snell, who could be an interesting addition late in your rookie drafts. We kick off this year's rookie profile series by covering the once heavily-hyped Bryce Love.